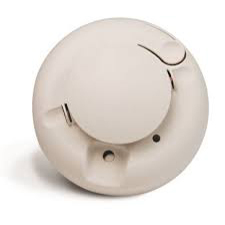 The Konnected smoke detector is a supervised wireless, battery powered photoelectric smoke sensor. The sensor includes a built-in sounder for alarm alerts, a visual status LED, and an Oversea wireless frequency transmitter. Under normal conditions (non-alarm) conditions, the LED flashes every 8 seconds while the sensor monitors the surrounding conditions. When the sensor detects smoke the LED lights, the built in sounder beeps loudly, and an alarm signal is transmitted.